In order for you to see exactly what you’re working with you’ll need to remove everything from the garage. Fortunately, you have a driveway that is designed for this very purpose. As you pull everything out you may want to put it into category piles. For instance one pile for sporting equipment and another for tools. Once that is completed, you can see exactly what should stay and what should go. Your garage walls are the perfect spots for hanging up most of what you’re keeping in storage in there. You can either put up designated hooks directly into the wall or hang up large sections of pegboard. The advantage of having pegboard is that you can easily move around the hooks as you replace certain items. Once you’ve designated a hook for a particular item that is where it should go after every use. This is an important habit for you and your family to get into. If you have a workbench in your garage, then it is a major culprit for clutter. There are plenty of options when it comes to organizing loose items like nails and screws. It might be helpful to buy a mini vac and keep it plugged in right on the workbench. Directly above the workbench could be another pegboard for your tools. 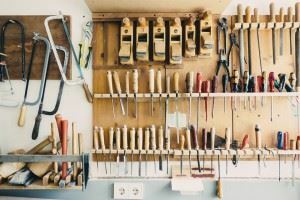 Just to make things clear, once the tools are hung you can trace around them forming an outline so you and everyone else in the house knows exactly what goes where. If you are in need of extra storage space then look up. There are many shelving units designed specifically to hang from rafters. You can even DIY rafter storage with some sturdy chains, hooks and plywood. As you start to move things back into the garage from the driveway, you might discover that a lot of stuff is being left behind. This is all the rubbish that you should turn over the Junk King Phoenix. There two-man crew can quickly load up all of this unwanted clutter and make sure it is disposed of in a responsible manner. You’ve spent the day cleaning out the garage. Now let Junk King Phoenix get rid of that rubbish once and for all. This entry was posted in Phoenix Junk Removal and tagged garage, Junk King Phoenix, junk removal, organizing on June 30, 2017 by Junk King. Last updated July 1, 2017 .